For foundations, there are lots of questions to reflect on when thinking about which evaluation practices best align with their strategy, culture, and mission. How much should a foundation invest in evaluation? What can they do to ensure that the information they receive from evaluation is useful to them? With whom should they share what they have learned? Considering these numerous questions in light of benchmarking data about what other foundations are doing can be informative and important. 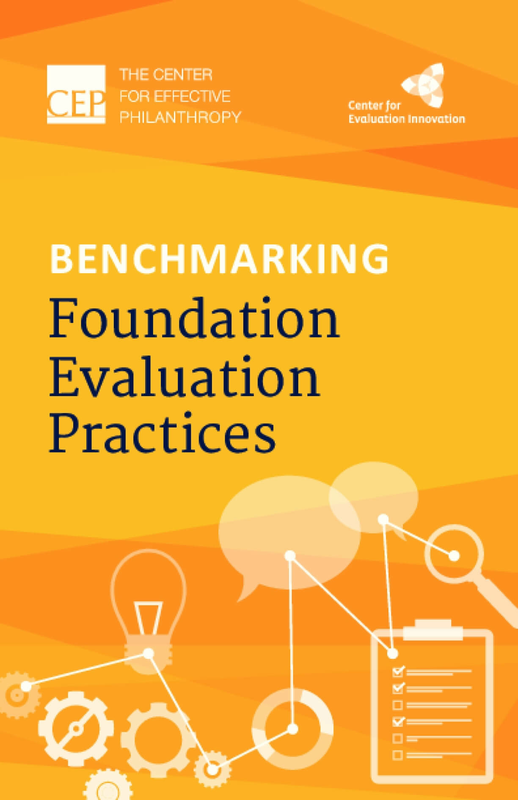 Developed in partnership with the Center for Evaluation Innovation (CEI), Benchmarking Foundation Evaluation Practices is the most comprehensive data collection effort to date on evaluation practices at foundations. The report shares data points and infographics on crucial topics related to evaluation at foundations, such as evaluation staffing and structures, investment in evaluation work, and the usefulness of evaluation information. 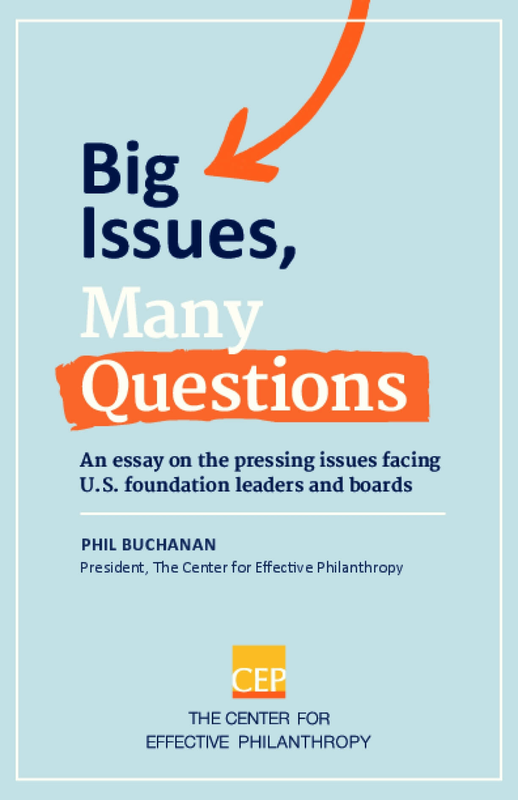 Findings in the report are based on survey responses from individuals who were either the most senior evaluation or program staff at foundations in the U.S. and Canada giving at least $10 million annually, or members of the Evaluation Roundtable, a network of foundation leaders in evaluation convened by CEI. 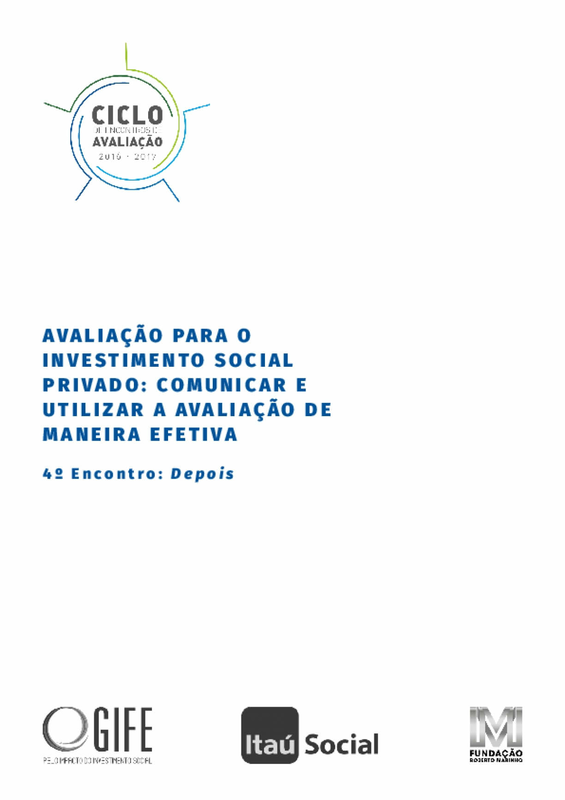 Publicação resultante das atividades da iniciativa Desenvolvimento Local e Grandes Empreendimentos (ID Local) do Centro de Estudos em Sustentabilidade da Fundação Getulio Vargas (GVces), em 2015, cujos temas principais foram monitoramento do desenvolvimento local e avaliação de impacto. São apresentados o escopo, os resultados e os aprendizados desse ciclo de trabalho, composto por uma série de encontros, uma viagem a campo (a jornada empresarial Terceira Margem), uma chamada e seleção de casos e o Fórum das Iniciativas Empresariais do GVces. Da mesma forma, são descritas duas experiências em monitoramento do desenvolvimento local e duas em avaliação de impacto de projetos selecionadas por meio da chamada de casos. 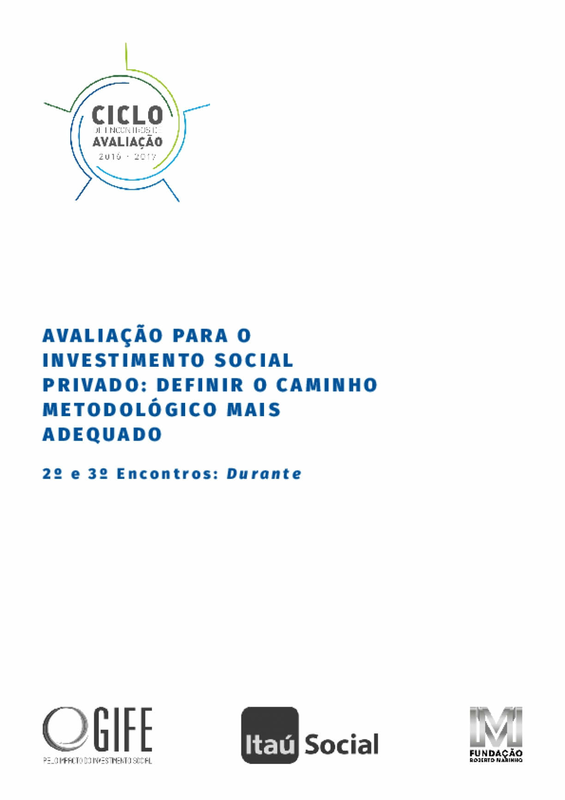 Publicação resultado do seminário internacional "Avaliação para o Investimento Social Privado" que busca fomentar e qualificar a cultura avaliativa de fundações e institutos voltados ao investimento social. Neste que é o terceiro encontro, realizado em agosto de 2014, foi abordada a relação entre os processos avaliativos e a estratégia organizacional, dando luz à questão sobre como a avaliação pode fortalecer as organizações e seus projetos e possibilitar maior efetividade. 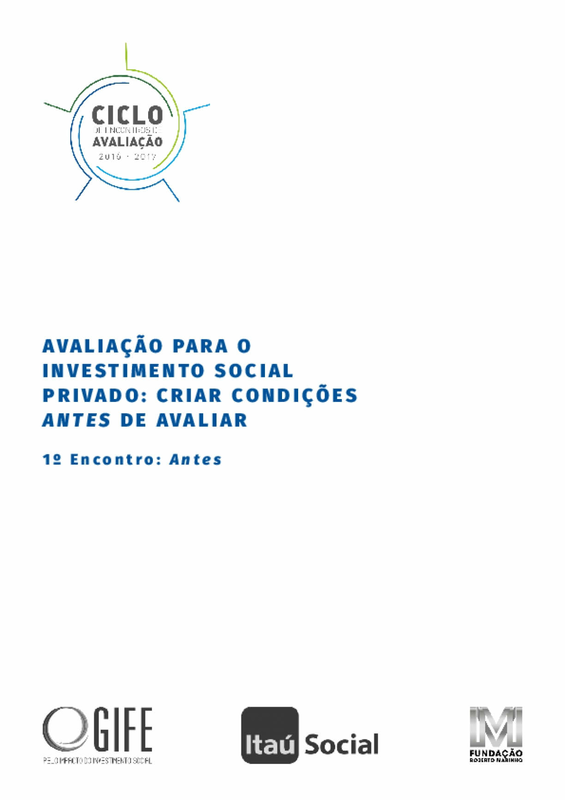 A publicação é organizada pela Fundação Itaú Social (Antonio Bara Bresolin), Fundação Roberto Marinho (Rosalina Soares e Monica Pinto) e Move Avaliação e Estratégia em Desenvolvimento Social (Rogério Silva) cujos representantes assinam artigos ao lado de dois dos três especialistas internacionais que participaram do seminário (Tessie Tzavaras Catsambas e Patricia Rogers) e de representantes do GIFE (Ana Leticia Silva e Andre Degenszajn). 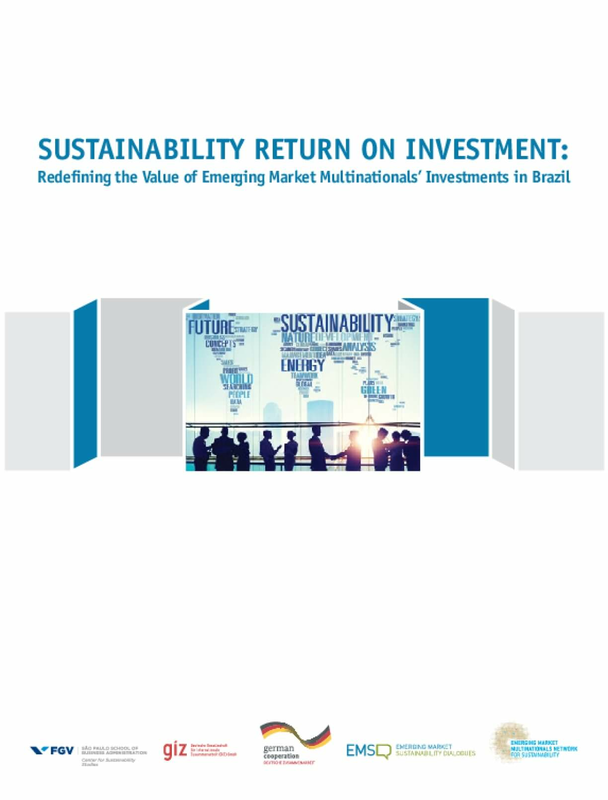 A publicação apresenta ainda relatos de práticas avaliativas das fundações Itaú Social e Roberto Marinho, bem como da organização Instituto Abraço do Tigre. Whether implicit or explicit, social justice and human rights are part of the mission of many philanthropies. Evaluation produced, sponsored, or consumed by these philanthropies that doesn't pay attention to the imperatives of cultural competency may be inconsistent with their missions. 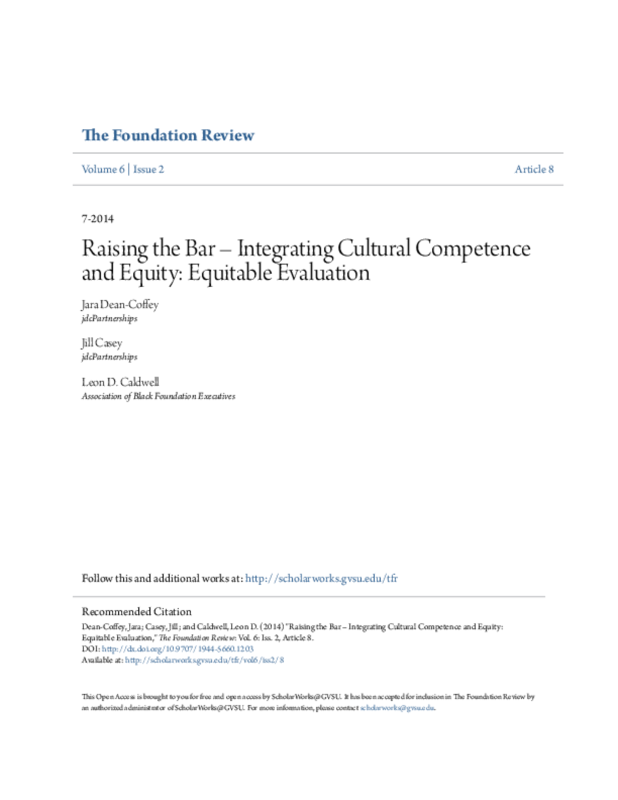 The American Evaluation Association's Statement on Cultural Competence provides those who produce, sponsor, and use evaluation an opportunity to examine and align their practices and policies within a context of racial and cultural equity and inclusion. The use of such a lens is paramount when evaluating a program whose goals touch on issues of equity or inclusion. 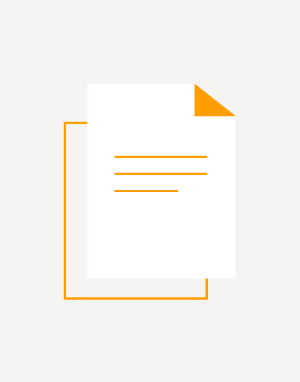 This article seeks to open a discussion of how philanthropy can use an equitable-evaluation approach to apply the principles of the AEA statement, present the concept of equitable evaluation alongside an approach for building equitable-evaluation capacity, and apply equitableevaluation capacity building to philanthropy.